i saw a picture on saveur magazine’s website of these firey-looking chicken wings and it made me crave. not for the wings, but for that crazy, bright sauce, and the crunch the picture promised. recently i vowed to start using my cookbooks at least once at the beginning of each month. but this recipe stole the spot of any i might have tried from my books in june. the only trick was trying to figure out how to make it vegetarian. i’ve had “buffalo potato wedges” at bars before, and coated and fried potatoes do get a crispy coating that stands up to being drowned in sauce. but the inner texture was not what i was going for. i wanted something a little juicier inside and a little chewier. 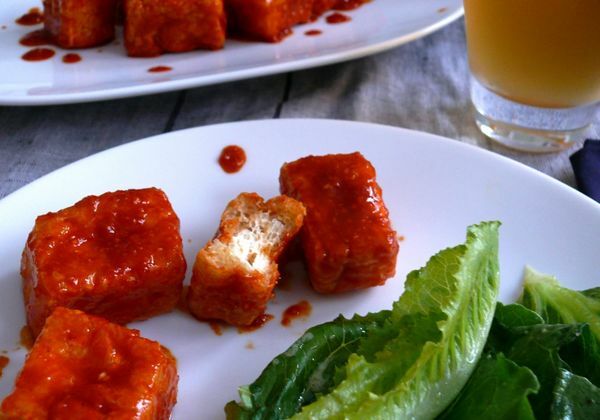 i thought about using soft tofu, breaded and fried the way the chicken wings in this recipe are. but i was a little worried that it might fall apart. so i settled on fried tofu balls that you can pick up in the refrigerated section of chinese grocery stores. success! a few minutes in an oiled skillet, turning so that each side browned, resulted in a very crispy outside and a still soft, chewy centre. 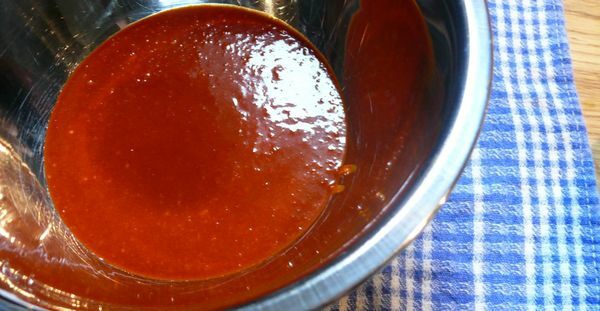 the spicy, tart and sweet sauce in this recipe makes a great condiment on its own, so the remaining 1/3 cup (the recipe yielded more than enough sauce to cover the package of tofu i fried) is in my fridge for me to dip into later this week. this is not the healthiest recipe, and eating it basically requires beer (the way eating chicken wings always does), but the good news is that it also screams for a vinegary salad, so you can balance your indulgences in this meal. the fork i placed at the table for this dinner was strictly for the salad. 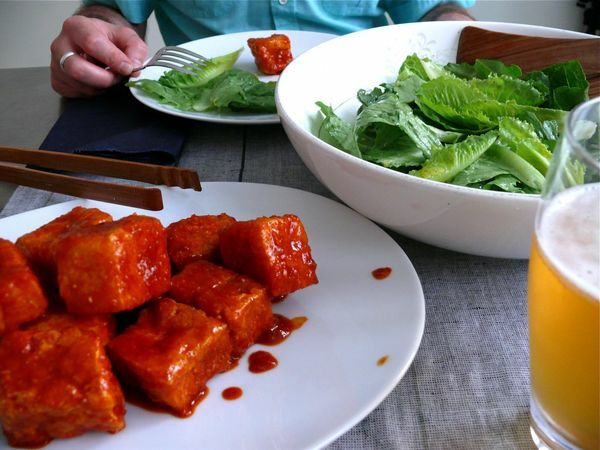 i ate every piece of this fried korean tofu with my fingers, biting into them just as i used to with wings, licking the sauce off each of my fingertips. by the end, i was eating the salad with my fingers too, dredging it through the sauce smattered across my plate. it was just as good after it cooled down too, so i think it would be great for potlucks and picnics this summer. just make extra and leave some at home, because once people get their hands on this, you’re not going to get your fair share. 2. whisk flour, cornstarch, and 2⁄3 cup water in another bowl. add chicken; toss. working in 3 batches, fry chicken coat the bottom of a large skillet with oil. 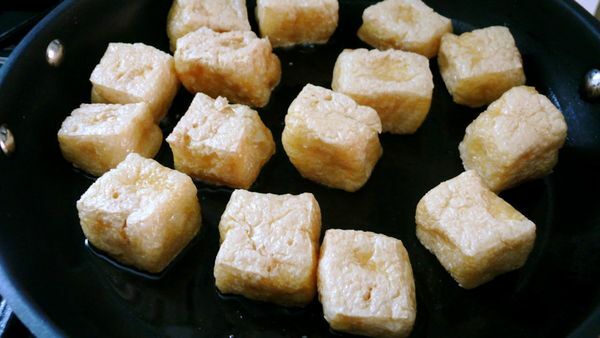 heat and fry tofu on all sides until golden, 6–8 minutes. drain on paper towels. return oil to 350˚. fry chicken until crisp, 6–8 minutes more. drain again. 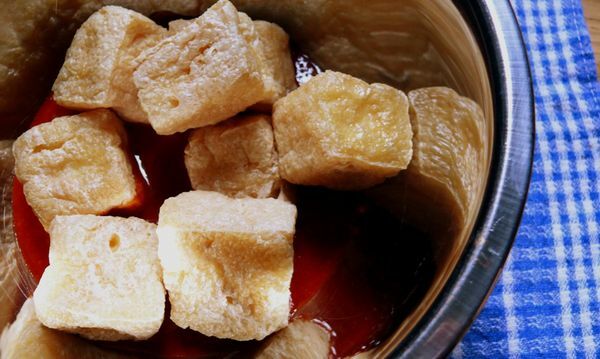 toss chicken tofu in sauce.